In Research Focus 2 (RF 2) of the IOW, the findings on the individual processes will be extrapolated to a larger, basin-wide scale. The aim is to analyse the current dynamics of the Baltic Sea system through observations and experiments and, by using computer-based simulations, to reproduce them as realistically as possible. To obtain three-dimensional images of water movements in the Baltic Sea with the highest possible resolution, IOW scientists regularly undertake expeditions in which state-of-the-art towed measurement instruments are deployed. 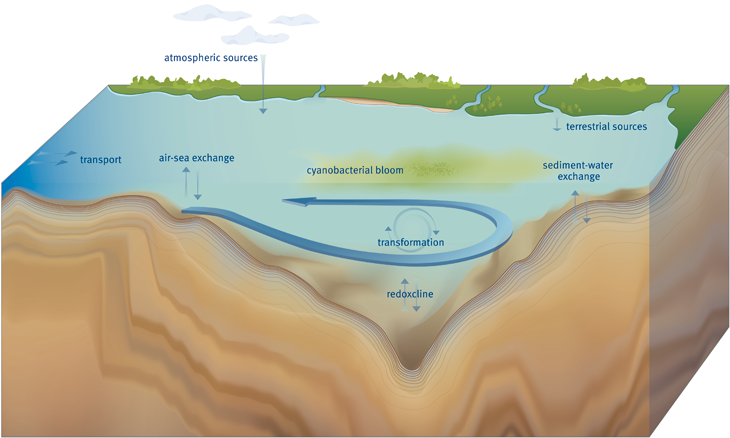 In determinations of the biodiversity in the entire Baltic Sea basin and the changes along its chemical gradients there is a strong emphasis on both the macrobenthos and the microbiological communities on the sea floor and in the water column. Using the data on water circulation and the role of organisms, the routes of important nutrients and pollutants through the sea and the food chain can be tracked. This in turn allows a determination of the amount that enters the sea, the amount again leaving the system, and the amount transformed along the way. The end result is a balance sheet for the basin as a whole. The changing environmental conditions that take place within the narrow confines of the Baltic Sea provide excellent conditions for comparative studies: What the IOW's scientists are able to discover at their doorstep has global implication for other coastal and marginal seas such as the Black Sea, the South China Sea and the Benguela upwelling system in the Atlantic, off the West African coast.